4 key positions of the Earth and the sun in the year with a fun online educational geography game. 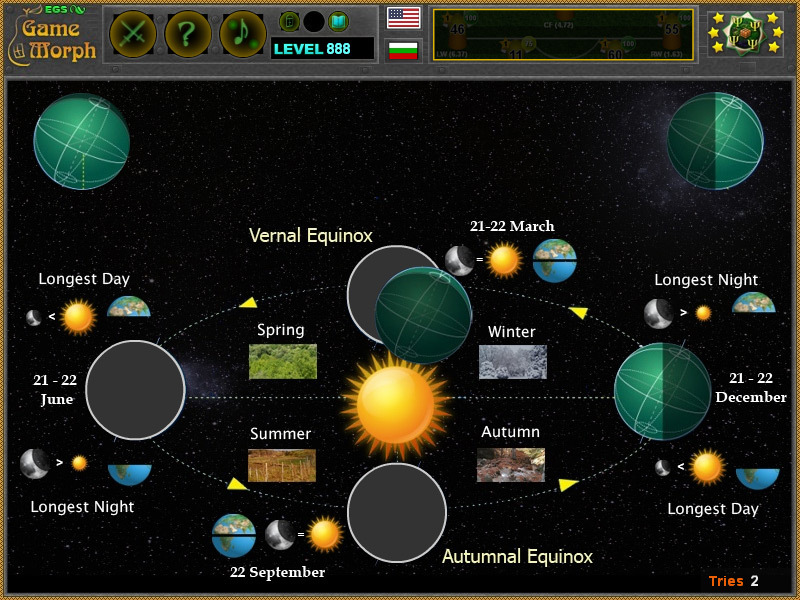 "Solstice and Equinox Online Puzzle" is a free online knowledge level game, about the position of the Earth and the Sun, connected to the seasons of the year. Drag and drop the pieces of the Solstice diagram. A small puzzle game for desktop computers, laptops and tablets, which may be played in the web browser. The Geography Knowledge Board include 4 pictures to play with. The game is part of the Interactive World Maps educational tools. What is the position of the Earth in Equinox? When is the longest night? Is the longest day different in different hemispheres? When is the longest day in Northern Hemisphere? How to play Solstice and Equinox Online Puzzle. There are 4 pictures of the earth position situated on top of the game screen. Every picture will fit in one emty socket on the Solstice diagram in the center of the screen. Drag and drop the pictures in the correct positions. The pictures will remain active, until they all are arranged correctly. There is a small counter to the bottom right. It is, as always, used only for evaluation in fun classes and will not affect the knowledge level achievement. Four tries for "A" and more than 8 tries for "F". Know the Equinox and longest day/night dates. Class subject: Solstice and Equinox. With a simple words, Solstice and Equinox, is about the longest day in the year, the longest night in the year and the two dates when the day and the night are equal in duration. While the Equinox is the same in the northern and southern hemisphere, the longest day, and the longest night are different in different hemispheres, because the earth is tilted. Here are how they should be. 1. Vernal Equinox: 21 - 22 March, day and night are of approximately equal duration all over the planet. 2. Summer Solstice : 21 - 22 June, the longest day and the shortest night. 3. Autumnal Equinox: 21 - 22 September, day and night are of approximately equal duration all over the planet. 4. Winter Solstice : 21 - 22 December, the longest night and the shortest day. 2. Summer Solstice : 21 - 22 June, the longest night and the shortest day. 4. Winter Solstice : 21 - 22 December, the longest day and the shortest night. Labels: Diagram Games , Puzzle Games , Flash Games , Geography Games , Education Games , Free Online Games.